How to get train tickets to Machu Picchu? Train tickets to Machu Picchu are purchased online or in Cusco. The most used form by tourists from all over the world is the internet. By booking the ticket through the web, the entrance to the Wonder of the World is guaranteed. How to book train tickets on the web? You just have to choose the type of train, the date of the trip, the personal data and make the payment. How early do I need to book train tickets to Machu Picchu? How is the train route to Machu Picchu? The train trip to Machu Picchu travels through the beautiful landscapes of the Sacred Valley from Cusco (or Ollantaytambo) to Aguas Calientes, the final destination. This picturesque town is known as Machu Picchu town because it is located at the foot of the Wonder of the World. During the journey (approximately 2 hours), the tourist can enjoy a quality on board service. Depending on the type of service, there are dance shows on board, live music, welcome cocktails, gourmet lunch and even free bar. There are 2 railway companies: Peru Rail and Inca Rail. Both have various services, from tourist class (economic), to the most exclusive services. Belmond Hiram Bingham (luxury train). 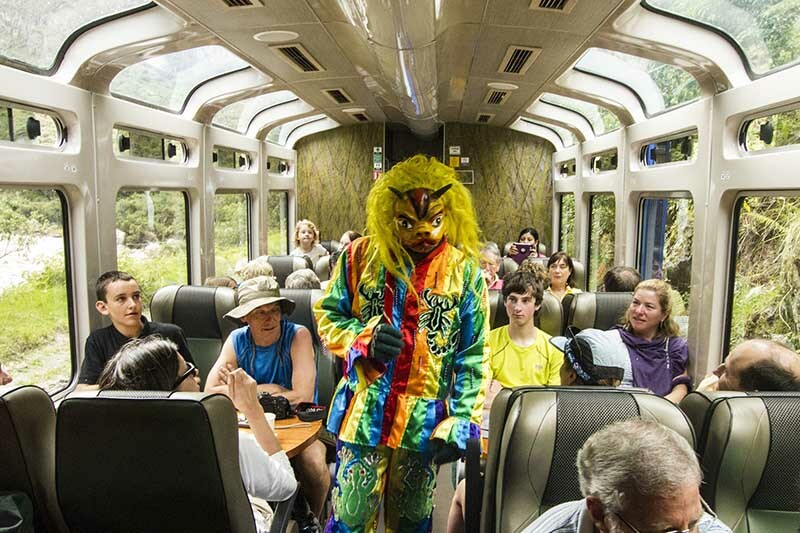 Learn more about the train service to Machu Picchu. The 2 most important things to visit Machu Picchu are getting entrance tickets and train tickets to Aguas Calientes. Enter the official websites of Peru Rail or Inca Rail. In the main menu choose the date, time, type of train and number of passengers. Fill out the reservation form with your personal information: names, nationality, passport, etc. Make the payment online through the different means of payment of Peru Rail and Inca Rail: PayPal, Western Union, Visa, MasterCard. After making the reservation and payment, print the tickets. Tickets must be presented at the train station, the day of your trip to Machu Picchu. What are the train schedules to Machu Picchu? The trains to Machu Picchu depart every day from 3 stations: Poroy (Cusco), Urubamba and Ollantaytambo. The round trip is at an exact time. 8.53 am (Ollantaytambo Station) 10.29 a.m. Train timetable ‘The Private’ Inca Rail. How much in advance do I need to book train tickets to Machu Picchu? You can book train tickets to Machu Picchu up to 3 weeks in advance. If you are coming during the high season of tourism (between April to October); It will be necessary some months in advance, due to the high demand for tickets. Train tickets are as important as the entrances to Machu Picchu. It is recommended to make the reservation immediately after knowing the dates of entry to the Wonder of the World. The train ride from Ollantaytambo to Aguas Calientes takes about 2 hours. The route is incredibly beautiful. Tour the Sacred Valley of the Incas next to the Urubamba River. In the distance you can see the Vilcabamba chain in the Andes Mountains. Most trains depart from Ollantaytambo station. The final destination is Aguas Calientes (Machu Picchu town). The distance is 30.5 kilometers. You will have to book the train tickets, only after booking the Machu Picchu tickets. If you have any disability, special medical or physical condition, inform the company. There are cases where the staff will prevent you from boarding the train for safety reasons. Your ‘passport’ is extremely important, since you will not be allowed to board the car if you do not present this valid identity document. If for some strange reason you have to cancel your trip to Machu Picchu, do it 30 days before. Remember that less time between the cancellation and the travel date, the penalty will be higher. You can cancel your train ticket up to 24 hours before. After this time you will have no option to exchange or refund of any kind. Remember that weather conditions and others outside the control of train companies, can cause delays, reprogramming or even the cancellation of itineraries. 1) Is the train ticket to Machu Picchu valid for 1 day only? Yes. The ticket can only be used for the date and time shown on the ticket. The ticket can not be used for a day different from the one indicated. 2) How much does the train ticket to Machu Picchu cost? Train ticket prices depend on the type of service. Check the Machu Picchu 2018 train fare. 3) Can you buy train tickets in Cusco? Yes. Although not recommended, train tickets can also be purchased directly in Cusco. The purchase made with days in advance. 4) Where are the ticket sales offices located in Cusco? Ollantaytambo station : Av. Ferrocarril s / n, Ollantaytambo, Sacred Valley (Cusco). Poroy Station : Roldan Street s / n, District of Poroy, Cusco. Urubamba station : Av. Ferrocarril s / n, Urubamba, Sacred Valley (Cusco). 5) What is the local train? The local train to Machu Picchu is an exclusive service for Peruvian citizens and residents of the Cusco region. These trains are not tourist so the cost is symbolic 10 Peruvian soles (3 U$D). 6) What is the Hydropower train station? The Hydroelectric station is the busiest used by tourists. It is located approximately 10 kilometers from the Machu Picchu station. Although it is possible to buy tickets and travel by train, most tourists prefer to walk (2 hours). 7) Do children pay the normal price of the train ticket to Machu Picchu? No. Children from 0 to 3 years old do not pay the price of the train ticket as long as they travel in the arms of the father or mother. Children from 3 to 12 years old have a 50% discount. 8) How long does it take to travel by train to Machu Picchu? The train ride from the city of Cusco takes more than 3 hours. The Urubamba section, 2 hours and 30 minutes and the section from Ollantaytambo, a maximum of 2 hours. 9) Who can not take the train to Machu Picchu? People who are drunk or under the influence of drugs can not board the train. 10) How to get to Machu Picchu without a train? The most used way to get to Machu Picchu without a train is the alternative route through Hidroeléctrica. This form is longer (6 or 7 hours) but it is the most economical.